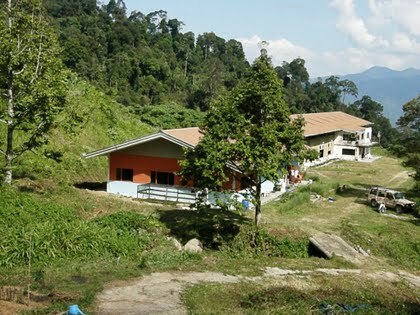 The Sustainable Living Centre (SLC) in Bukit Antarabangsa, Kuala Lumpur is a non-profit organization operating a small demo and education center promoting “green” living concepts for urban settings. The Centre conducts presentations on how to use energy, water, food and air resources more wisely. They also offer visitors a chance to learn organic gardening with chemical-free methods for growing fruits, spices, vegetables and herbs. HS Wong founded the Centre in 1998 to spread sustainable living concepts that can be applied to urban living. The Centre is managed and designed by Permaculture Sdn. Bhd. in partnership with Permaculture Visions International. At present SLC conducts presentations to groups at a minimal fee. Students are not charged for admission. The Centre implements different energy-reducing models around its facility to demonstrate a more efficient way of using resources. They incorporate “green” building techniques to move air around for better insulation. The building is equipped with air-turbines, air-vents, louvres and heat-resistant materials. This effectively reduces the need for using air conditioners and fans, in addition to making fridges more energy efficient. SLC has a garden model that uses chemical-free methods for growing plants. They use multi-cropping techniques for bayam, lettuces, chillies, kangkong and others, maintained through a combination of mulching and composting. To facilitate water efficiency, the Centre uses its own uniquely designed Rainwater Collection system. Click here to view an illustration. SLC also implements a complete water system to facilitate better use of resources. Greywater (those that come from wash basins, washing machines or the sink) are treated and recycled for reuse at the facility. The Centre treats its own wastewater with a mini-wetland system composed of filter beds and aquatic plants. Potable water is also produced from these same resources with UV lamps. The Centre welcomes WWoOFers (Willing Workers on Organic Farms).